We have knocked off snowing and started raining. Gloom sets in on the hills, mist creeps into the Bredbo pub, and afar the trees droop. Rabbits lurk in their burrows, and stark lie the valleys. Brush up the town. I am coming back. So is Wep and his missis. How they shall miss their little lad Lennie! Sadness shall be their lot! The publican is about to shout. I don’t shout – I sing. I didn’t solve the mystery of the missing golf course in Adaminaby. Circumstantial evidence implicates a Scotsman seen with a spade looking for a golf ball. We left the town in tears. We had to. Everybody else was moving out. Don’t know whether I should go home. I have lost those fox skins – the whole five bobs’ worth! I shall cut the back out of Mrs. Wep’s fur on the way back. She doesn’t know about it yet. I am saving it up till I get to Darlinghurst. I talk too much. It was a proud moment for the Daily Telegraph Polar expedition when it bought all the eggs in Jindabyne. The whole six of them. The hens had staged a stand-up strike. The butcher here is a butcheress, and wields a classy cleaver. A traffic cop in this town would have to bring his knitting with him if he wanted to keep awake. There is a small, round, silent cop in the main street, but nobody seems to know why. I have met the man from Snowy River. He wears two pairs of trousers, drinks rum, and doesn’t like food with his meals. He was a great disappointment to me. Poor Wep, my caravan comrade, has decided to paint something. None of the scenery around here seems to suit him. I tried all kinds of scenery on him, but I’m afraid that the Main Roads Board will have to make a few alterations in the general contour of the country before Wep is satisfied. Another thing is that he just made out his expense account and I had to post it for him. He must have a conscience, because every time he approached the post office he went red in the face and became boyishly embarrassed, the burglar. Having no craven inhibitions, I posted it for him. When I get the courage I will send in my own expense account. The wee snowflakes have started flickering down. Have you ever heard a bullock driver singing “Drifting and Dreaming”? And accompanying himself with a 20-foot whip? I have, and you needn’t lie awake worrying about it. Well, we must be getting along. Damn all Test matches. I strolled down to the Jindabyne pub last night to listen to the test match. All was bright and gay within. Without, bleakness had set in in large frozen chunks. The time came when I had to return to the caravan. Bright, brittle moonlight was pasted all over the road, and the road went for miles and miles in the wrong direction. After some hours of steady trudging I had an idea that I should be somewhere about the Gulf of Carpentaria. I yelled “Coo-ee” in a forlorn, hope-less way, and the echo from the hills nearby made me burst into tears. I had no matches, no money, no tobacco, and no handkerchief. I said to myself, “Lower, this is no time for panic. Keep a grip on yourself. Don’t get hysterical. So I kept on walking, and hours and hours later I found myself outside the same pub. I have in there, and rapped feebly on the door. They let me in and gave me a bed with two hundred blankets on it. In the morning I went and had a look at the bathroom, smiled politely at it, and came away again. I then sought out Straw Weston, the publican. “I have no money to pay for my room,” I said, getting ready to run like mad. I then proceeded to get lost all over again. Early in the afternoon I found the caravan. The inmates sneered at me, but I was too weak to object. Next time I go out, I’m going to be hung all over with hurricane lamps and fog horns. This is no place for a man who has been delicately brought up in Darlinghurst. 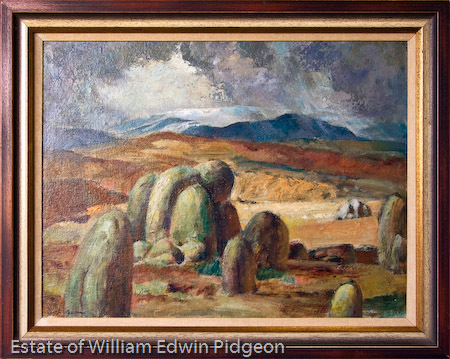 Wep, my artist friend, is away in the hills painting rocks. Some people have quaint hobbies. All I’ve got to do now is to find the post office all over again. If ever I get back to Sydney, the first person who says to me, “Did you enjoy the trip?” gets a smack in the teeth. I am in the bushranger belt, I am informed. The longer I sojourn in our country districts the more gullible I become. I am convinced now that the only reason why the man from the bush bought the sundial from the Sydney Botanic Gardens was because he needed a sundial, and it looked like a bargain. And anyhow, he borrowed the purchase price from the con. man who sold it to him. I believe there was a time when you could sell a farmer an egg-beater and assure him he could get 2BL on it. Now I, the City Shrewdy, have been loaded with four fox skins – with the bullet holes carefully plugged up and brushed over – at a guinea a skin. I have a suggestion for the Chief of Police. Have the Consorting Act repealed and let the city shrewd heads loose in the country. If they don’t come and give themselves up voluntarily, it will be because they are too ashamed. But I will tell you something. I am the best snooker, draughts, domino, and billiards player in the Monaro district. I am also the best fighting man for miles around. I am keeping this to myself, however. Jealousy may rear its ugly head. Don’t try to give away a 2/6 fountain-pen as a token of goodwill. You will immediately become suspect. Accept 6/ as a deposit, spend 1/ of it in shouting the purchaser, and then go somewhere else. I have this from a man who is now touring the country on his way to Victoria. And, may the saints forgive me, I bought a fourpenny self-propelling pencil from him for 3/6 before he left town. I have some delightful fox skins I wish to dispose of, as I am leaving the country. I wish I was back in Darlinghurst, where you know what to expect.